Oliva & Oliva Italic are two heavy display typefaces with some strong references to type classics from the 1930s till the 1970s. 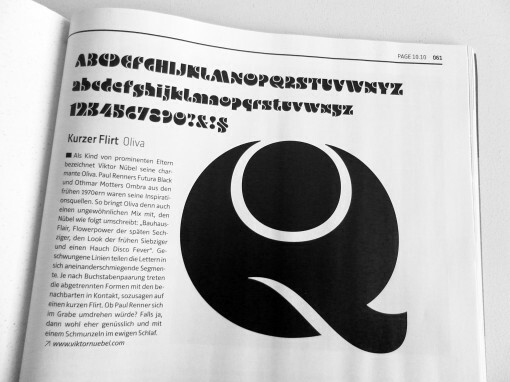 While Oliva takes it’s main inspiration from typefaces as Futura Black and Motter Ombra, OlivaItalic has been spiced up with Stilla, a typeface by François Boltana from the early 1970s, and some Femina—a Othmar Motter typeface again. You might also taste a note of Allegro by Hans Bohn from the 1930s to complete the mixture. Try and buy these fonts at MyFonts or Fontspring. There is also a webfont specimen for Oliva! Upright and italic version work together like brother and sister. For ›i‹ and ›j‹ there are alternative glyphs available, accessible with the OpenType feature Stylistiv Alternates or Stylistic Set 01. Special figures for superscript and subscript, numerators and denominators and also an OptenType feature for creating fractions. The fonts contain a set of arrows and ornamental icons. Oliva & Oliva Italic are OpenType Pro, featuring full Western, Central European, Baltic, Turkish and also Cyrillic language support. Cyrillic Oliva & Oliva Italic include cyrillic language support, with alternate versions for some letters. I’ve done this after a trip to Moscow with that I’ve remembered that I’ve learned russian in school for some years (but I’m far from still speaking it). For the design of the letters I got great ›native‹ help by ukraine type designer Sergiy S. Tkachenko. Oliva & Oliva Italic are OpenType fonts with an extended set of glyphs and contemporary OpenType features.